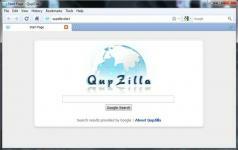 QupZilla is a speedy, cross-platform QtWebKit browser equipped with all essential functions a web browser should have. Among the basic features you will find multi-tab support, history, bookmarks, a built-in RSS reader, an adblocker and a tool for blocking Flash content. QupZilla uses icons from the active desktop icon theme and the native widgets style on popular Linux desktop environments but you can switch to a different theme any time you want. On top of that, you can access bookmarks, the RSS Reader, and history in the same, neatly-organized window. The Speed Dial feature enables you to quickly open your most used web pages from a newly opened tab. Last, but not least, the integrated ad-blocker will ensure the best possible browsing speed as well as save bandwidth once you update EasilyList and optionally add some custom rules.